↑ "Enter the Teacher to the Dragon of Martial Arts Films". The New York Times. 23 January 2011. Retrieved 17 December 2011. 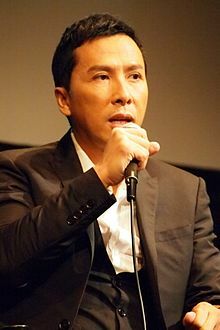 ↑ "Donnie Yen: The Evolution of an American Martial Artist". Kung Fu Magazine. 23 December 2000. Retrieved 11 May 2015. ↑ "Learning Wing Chun – Why I Started Wing Chun". Practice Wing Chun. 13 December 2010. Retrieved 17 December 2011. ↑ Ah Beng (26 July 2010). "Ip Man 1 & 2 (Donnie Yen) | Tai Chi". Infinity.usanethosting.com. Retrieved 17 December 2011. ↑ "Finding a Wing Chun School in Manila | Applied Wing Chun Philippines". Appliedwingchunph.com. 28 November 2010. Retrieved 17 December 2011.